We offer a complete Engineering CAD add-on that runs inside AutoCAD (Full Version or vertical like AutoCAD Civil or Plant 3D), IntelliCAD or even with our AViCAD alternative. Now updated to run in the latest AutoCAD 2020! The Full Suite contains our Mechanical, Piping, Ducting & Structural modules. If you have CAD, these Modules can also be purchased separately. AViCAD is for anyone who wants a fast and efficient CAD program with all the power and versatility of standard programs such as AutoCAD or AutoCAD LT. It’s a powerful CAD engine that provides a great alternative to even the latest releases of AutoCAD. AViCAD is more compatible with AutoCAD DWGs and commands than any other CAD product. It uses the same file formats including those for drawings (.dwg files), commands, linetypes, hatch patterns, and text styles. You can also use AutoCAD menu files and even import your AutoLISP programs. AViCAD(TM) provides additional tools such as the Express Tools with advanced CAD features, and is supported by the latest Windows 7,8 & 10 32 & 64 bit releases. AViCAD offers the same functionality found within AutoCAD® but at a fraction of the price. When coupled with AViCAD and our free Mech-Q Plant Design utilities – you’ll be able to produce CAD and Mechanical drawings very quickly with minimal software investment. Our latest AViCAD version delivers even faster drafting with 64 bit support for Windows. 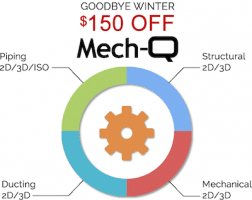 Note: Interested in Mech-Q for AutoCAD? – please visit this page. Subscriptions and Lifetime licensing available. An amazing CAD Piping add-on that that contains various piping modules. Includes thousands of orthogonal pipe, fittings and valves each customized to your specifications. This package also includes a 2D/3D complete CAD drafting alternative to AutoCAD®.